(Bloomberg) -- After defaulting in November, embattled Brazilian construction giant Odebrecht Engenharia e Construcao SA appeared determined to move quickly to negotiate with creditors. One month later, the company began talks with some of its largest bondholders, granting them access to confidential information and agreeing to reimburse them for some fees. The two sides held follow-up conversations as a prelude to a sitdown in New York on Feb. 27, when the Brazilian company was due to present its proposal to restructure around $3 billion of debt. Odebrecht wasn’t ready, though. It offered to meet only if the bondholder group extended private discussions by another month and, when bondholders refused, the meeting was canceled. Stuck with bonds that are trading at a mere 15 cents on the dollar, its largest creditor is growing impatient. Odebrecht is running short on cash. Softer spending on infrastructure projects across Latin America has put pressure on its business, on top of the billions of dollars in fines that the company and its parent have agreed to pay as a result a 2014 corruption scandal. Without a restructuring or renegotiation of its debt, the company will likely have to file for bankruptcy, analysts at S&P Global Ratings wrote in a November note. 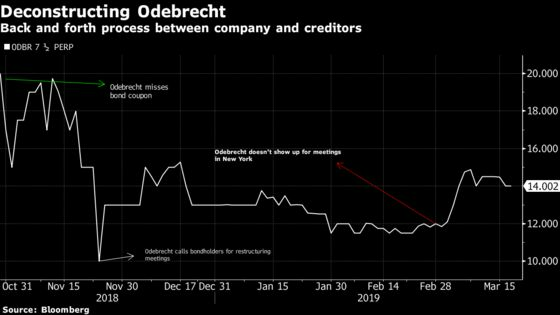 Odebrecht “remains committed to discussing and negotiating a restructuring transaction” with the bondholder group, a company spokeswoman said. After the period of private discussions ended, the Gramercy-led group made its own restructuring proposal public this month. The plan offers the company a four-year extension in maturities and no haircut on the face value of the debt. It allows for interest payments to be made through the issuance of additional bonds rather than cash until the end of 2021. Odebrecht is preparing to submit this offer by the end of March, according to a person with direct knowledge of the plan, who asked not to be named as the matter isn’t public. Gramercy’s Rauch said creditors are willing to resume talks and expects the company to re-engage by the end of the month. "Our proposal was structured to work within the framework of the business plan the company detailed to us in February," Rauch said. Among the most controversial aspects of the group’s proposal are provisions that require Odebrecht’s parent company to make a $375 million cash infusion into the construction unit, and blocks dividend payments to parent Odebrecht SA until the restructured bonds have been repaid in full. Bondholders have also asked for a lien on Odebrecht’s controlling stake in petrochemical company Braskem, which the Brazilian company has been in talks to sell. They also want the parent company to pay any fines levied against it with its own cash. Odebrecht, which has not yet made public any details of its proposal, has considered imposing “aggressive” haircuts on the debt and a range of options including a debt-for-equity swap, Bloomberg previously reported.